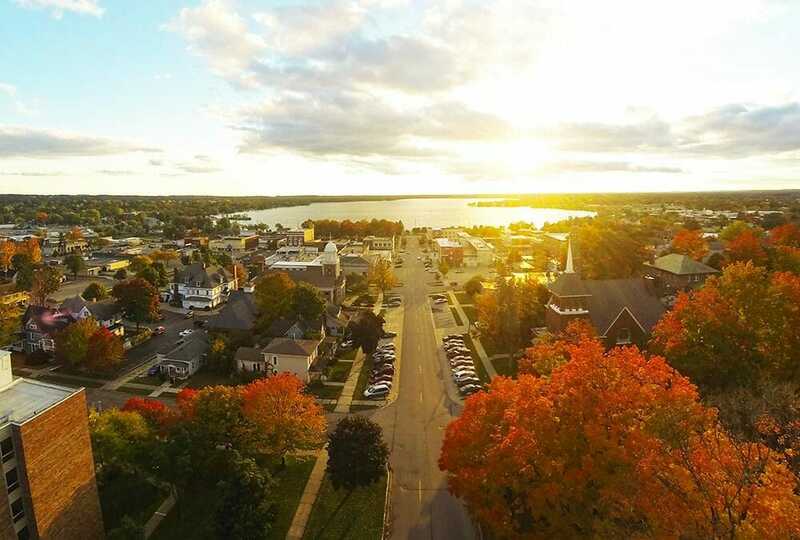 Fall Color in Cadillac is second to none. Breath taking views can be seen from your car, bicycle, kayak, canoe, motorcycle, train and by foot. You name your mode of transportation, and you’ll experience unforgettable views. 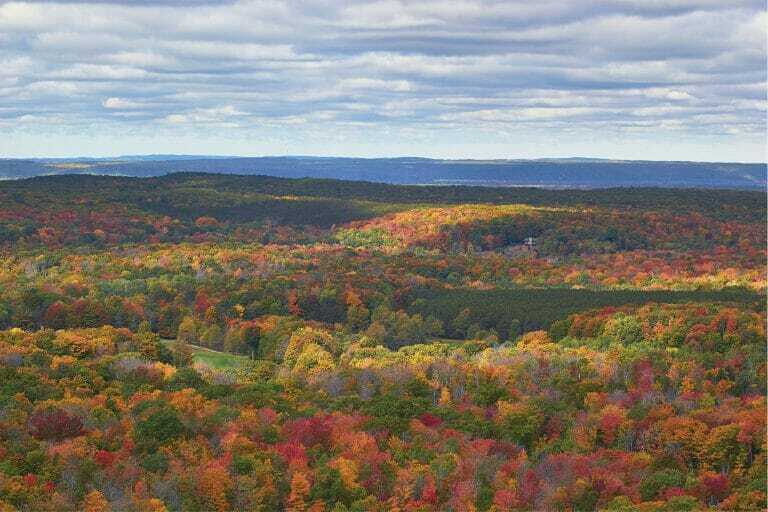 Here are our favorite self-guided tours combined with local hot spots, and fantastic views, compliments of the Huron-Manistee National Forest.  We’ve also listed additional activities you can enjoy in the Cadillac area while Mother Nature transitions from summer green to fall gold, to winter white. ORANGE ROUTE (see map at bottom of page): Drive on Old 131 to Granite Street. Turn Right on Granite St, which turns into Sunnyside Dr. Take this to M-115. Turn right onto M-115, after ½ mile turn left onto M-55 west. On this tour, you will travel around both Lake Cadillac and Lake Mitchell and see the beautifully balanced panorama of woods and waters. 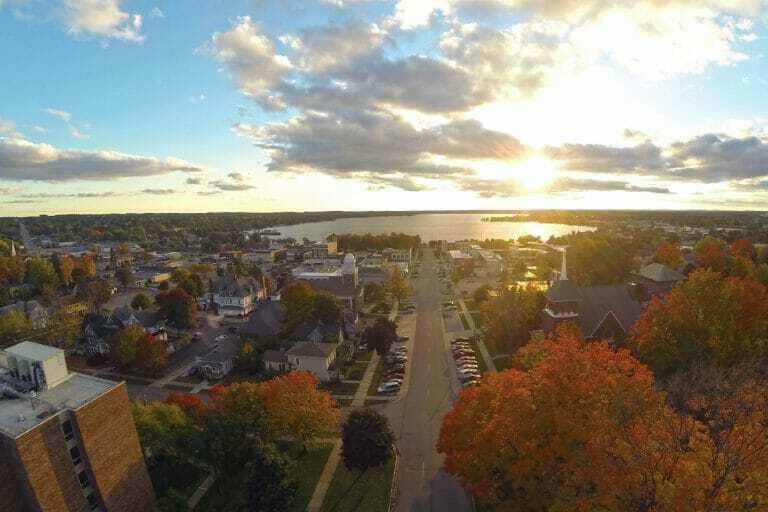 Lake Cadillac Area: public park, Sound Garden, Clam River Greenway, picturesque pavilion, city boat docks and memorial fountain, Kenwood beach and park, public bathrooms, boat launch and 27 holes of Disc Golf. Canal area: Cadillac’s famous canal freezes before the lakes then as the lakes freeze the canal thaws and is open all winter. Mitchell State Park: camping, Carl T Johnson Hunting & Fishing Museum & Visitors Center and an interpretive Heritage Trail. Foodie Picks: Hermann’s European Cafe (Downtown), Clam Lake Beer Co. (Downtown), Cheryl’s Landing (homemade soup), Lakeside Charlies (on the water), Burke’s Waterfront Restaurant (burritos & french fried ice cream), The Sweet Shop (XL caramel apples) and Willow Mercantile (local produce, jellies, beer, wine…). YELLOW ROUTE (see map at bottom of page): Begin by going west on M-55 to 25 Rd. Take 25 Rd north to Boon Rd (34 Rd). Turn west/left on Boon Rd and drive through Boon and Harrietta to M-37. For a different pace continue on 30 Rd heading west and take Coates Highway down to the Big Manistee River or take a stroll down to the waterfall (directions to waterfall can be picked up at Cadillac Visitor’s Bureau). To stay on the designated tour, continue north on M-37 to M-115 in Mesick. Either drive northwest on M-115 to 9 Rd and into Glengary (14 Rd) (The Glengary area roads may be rough if weather conditions are wet) and back onto M-42 to 15 Rd. You may also turn southeast on M-115 and north onto 15 Rd. 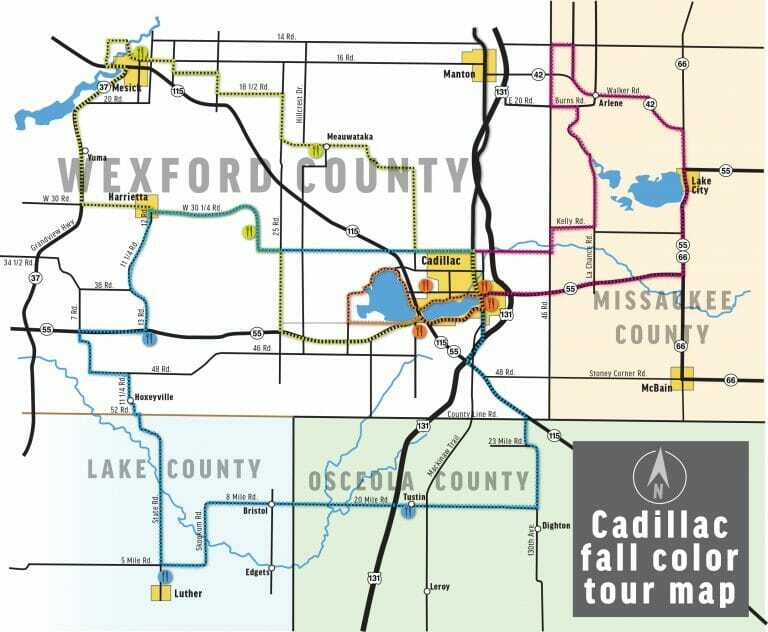 These backroads will lead you through a very colorful route through Meauwataka and back to Cadillac. Park and sit along the lakeshore or at a picnic table along the Lake Mitchell Day Use Park (off M-115), adjacent to the canal. Take in some history along M-55, turn L onto 25 Rd, approx. 100 ft is a CC Camp historical marker and remains. Just west of Harrietta is the MDNR Harrietta Fish Hatchery and visitors center (open week days only in fall). South of Mesick on the southern tip of Hodenpyle Pond: from M-37, head W on 26 Rd to O’Rourke Dr/ Hodenpyle Dam Rd and stroll down to the Waterfall, then continue N on M-37 to M-115 in Mesick. Just shy of Mesick on M-37 stop at the Scott Wheeler Roadside Park, great view! Foodie Picks: Meauwataka Store jerky and Boon Store famous Boon Cheese. BLUE ROUTE (see map at bottom of page): Drive South on Old 131 to Mackinaw Trail. Turn right on Mackinaw Trail and follow it to M-115. Turn east (left) on M-115 and then south on Dighton Rd (130th). You may either turn west on 20 Mile Road or continue on Dighton Rd to 18 Mile. Turn west onto 18 Mile Rd then north onto 140th Ave. Take 140th Ave north to 20 Mile Rd, follow this into Tustin and then into the Bristol area. You will then venture onto State Rd north, across the Pine River to 48 Rd to 7 ½ Rd, north to Boon Rd in Harrietta. Turn right onto Boon Rd and back to Cadillac. Foodie Picks: Coyote Crossing Restaurant, turn right/south just past Caberfae Road, down the road on the left. PURPLE ROUTE (see map at bottom of page): Begin at Color Tour Headquarters, downtown Cadillac, and proceed north on old US 131 (Mitchell St) to Boon Rd. turn east (right) on Boon Rd, which becomes Seeley Rd north and then Rosted Rd east, staying on the paved road. Turn north (left) on La Chance Rd, go through Jennings, and then turn west (left) on Burns Rd. Turn north (right) on Seeley Rd crossing M-42/Mike & Tony Rd. Seeley Rd then becomes 49 Rd. Continue on 49 Rd north to Roby Rd and then head east (turn right) on Roby to Brown Rd. Turn south (right) on Brown Rd, taking it to M-42/ Walker Rd. Go east (left) on M-42 to M-66 south. M-66 south will take you through Lake City and then head west on M-55 towards downtown Cadillac. Attractions: located between US 131 & Seeley Road on M-42 is Dutchman Tree Farm, one of the largest Christmas Tree Farms in the area. Rather than continuing on Seeley Road north, turn left/west onto M-42, to the farm, offering a Christmas Village in December. Foodies: In downtown Lake City, Food Factory & Coffee Cup are suggested local hot spots.